Sometimes, a nice DVD can bring another dimension to a topic we're studying in school, or help fill a rainy afternoon. 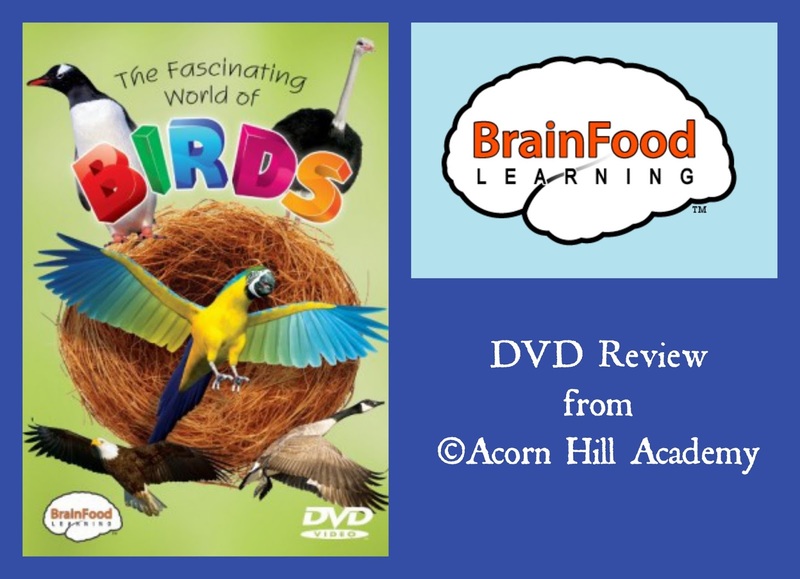 The Fascinating World of Birds DVD from Brainfood Learning sounded good - a DVD to pop in when you need a little TV break, and educational to boot! Everyone can learn a little something new about birds, right? We love birds at our house. We keep our feeders filled and our entire family enjoys watching the birds as the visit. We've learned to identify several species just by having the feeders out. I was excited to receive a copy of this DVD to review. 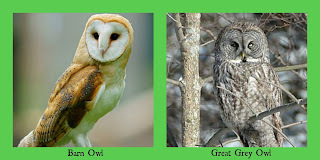 The video first presents some characteristics that are common to all birds, and then moves on to teach about 10 specific birds, including ostriches, penguins, Canada geese, eagles, and more. The pictures and clips of live birds are beautiful. The program is set up in short segments, each giving some specific information. Following each segment, a vocabulary word is presented which relates back to what you've just learned. For example, after the segment on eagles, the vocabulary word is "raptors." After the section about hummingbirds, the word is "metabolism." 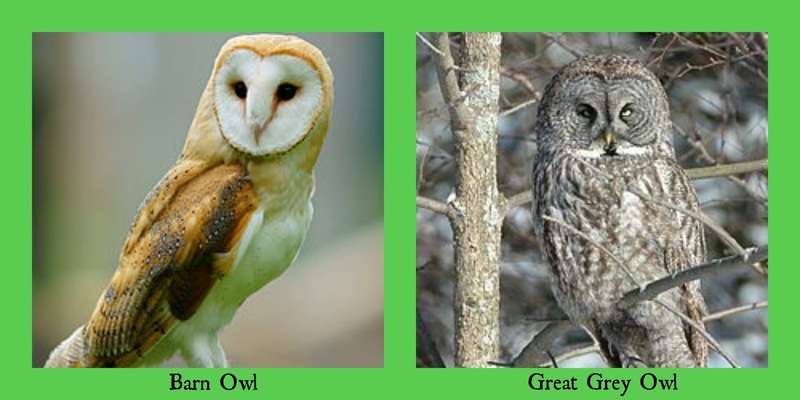 My children and I particularly enjoyed the video of a young owl who was trying to turn his face upside down. We laughed and laughed at that! It was not only adorable, but a great illustration of how flexible an owl's neck is. There is a four-part review at the end, progressing from the easiest topic (identifying specific birds) to the most difficult (vocabulary definitions). Multiple-choice answers appear on the screen after each question; both questions and answers are read aloud by the narrator, so even very young children can participate. The video program is basically someone reading facts about birds while we look at pictures and video clips. I would prefer to learn about the birds through a story, or perhaps a series of short stories, rather than a list of facts. However, this is just one resource. 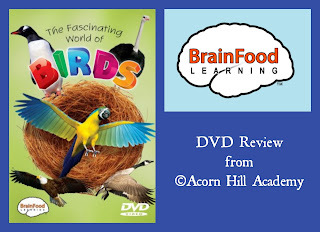 You certainly wouldn't expect to learn everything you wanted to know about birds from one short DVD program! I could see using this around a study of birds; many of the birds could be seen in the wild where we live, and special ones, like ostriches and penguins, are available to see at the zoo. That would be worth a field trip. We see lots of American robins and hummingbirds where we live, and sometimes we see Canadian geese. I will be sure to have my children watch for the things we learned in the video to see what they observe for themselves. My children and I did enjoy watching this program. The kids had a good time with the review questions, shouting out the answers. Even Isaac participated, and he's not usually that interested in things like this. The DVD is intended for all ages, and runs for about 44 minutes. It's available from Brainfood Learning for $14.99. They've recently added lesson plans for this DVD, and others, on their website. They are available here. The Schoolhouse Crew reviewed three DVDs from Brainfood Learning. Click to read more reviews!